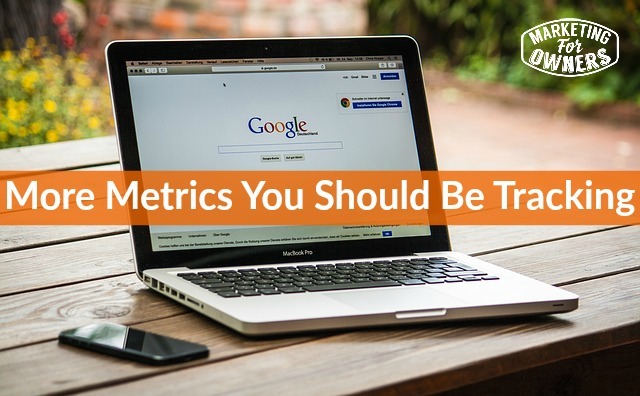 Metrics are things that need to be tracked. Yes, if you don’t like numbers sorry, you’re going to have to get to like numbers. If you have a business, it’s all about the numbers and it’s not just when you see your Accountant or your CPA after a few months, after a year, depends on how long you put that off. There are many things, we’ve discussed them in the past, conversion rates, money, anything to do with money, costs, everything like that, but there’s a bunch more metrics. Now in our world, we should be generating interesting, valuable content for our potential clients and for our existing clients to reinforce our authority, our expertise and our position in our local, or international or national industry and trade segment. I said a lot, I read that off, but I think I just made it up. But that’s what we should be doing. We have to provide interesting information, we have to be the source. You go to CNN, you go to the BBC, those kind of places for your information. We need to be the CNN or the BBC for our industry our trade our products so we need to supply all that information. That means that when people are ready to buy, they have been visiting your site or following or they are subscribed to your list, or whatever, then when they’re ready to buy, you are the person they come to. So, to make sure we are offering the right kind of content, there are other metrics we can measure. For example, this is all going to relate to online back on your website. So for example how long are they on your website? Oh, and I suppose I better stop there. This is under the understanding that you have analytics on your website. Google analytics is the de facto analytics program, it’s free. They do have a paid one, by the way (If you want a laugh go see how much that costs). But it’s free, everybody who knows what they are doing online will use Google analytics. Now there are additional programs such as Kiss Metrics and other things such as Crazy. There are many other things you can add and there are further analytics, but that’s enough. You can get all this information from that. If you don’t know by the way, how to get Google analytics on to your website, just e-mail me, jon@marketingforowners.com, ask me and I’ll point you in the right direction. No, sorry we don’t do that kind of thing, we don’t provide services like that, but I’ll point you in the right direction, it’s dead easy you can get it done very low price. So, how long are people on your website? So in other words, when they arrive; say they come from Google or wherever, they arrive at your website. How long are they spending to read it? If they are there for 10 seconds, it means they read 10 seconds worth, wasn’t really their thing and they’re back to Google. But if you can make sure your content is good, they will be there for longer and they will read the whole article. Yeah, you understand? What about how many pages they consume in one visit? So, again if you’re bringing people into an article and the average is one page, or just around one page, then it means that you are not directing them on to other content, or you don’t provide enough related content to that piece. If that was interesting, why wouldn’t they read something else that’s related? Perhaps you’re forgetting to put links within your content to your other articles to tempt people to read a little longer. I can think of a number of times when I’ve been to somebody’s site that I like and as I have gone down there are other links and I think, oh gosh, and I’ve had to open them up in new tabs and then go on and read those afterwards. I’ve ended up spending half an hour when I had just planned to just see what the article was about. I have ended up consuming about five pages and that’s good. So that’s what we want to do. What about how many repeat visitors? So a common metric for many is that 70 or 70 to 80% of the visitors are new. But how about if you get that down because you want more of more repeat visitors, yes, you want new ones, but you want a lot of people to come back. If they are not coming back, it’s because it wasn’t good enough, the content is not interesting enough. Or, you haven’t captured their lead, sent them information via e-mail, to tempt them to come back, to tell them what new information you’ve added. All this stuff starting to make sense? What about in e-mails? Now for instance when I just mentioned e-mail, if you’re not e-mail marketing, or e-mail marketing makes it sound like it’s some weird, difficult new thing you’ve got to learn, it’s not. E-mail marketing means you are sending e-mails with a purpose. This means you have a strategy, so it is just, see you’re sending out e-mails every day, but these are sending them to a targeted audience to convince them to become buyers eventually. To convince them you are an expert in your space and that you are worth following, so that when they’re ready to buy, they’ll try you. So, on your e-mails, how many clicks? So if you send out a number of e-mails and it’s got links in, because you want to put links in to get them back on to your website, don’t allow them to just read e-mails, get them back on to your website to encourage them to see what information is there and then they can look around about your products and services while they are there. So how many clicks? If people aren’t clicking what’s in your website, in your e-mail, perhaps you need to adjust the way you invite them to click. How about the open rate of those e-mails? That’s the core metric of e-mail marketing, the open rate. If the open rates aren’t good enough, if they are below 10% then you seriously need to get to work. It’s probably your subject matter, it might be your audience; have they not opted in? Are you spamming? Things like that. Don’t do that, by the way. And how many unsubscribes? Now some people push the envelope and say that if you’re not getting many unsubscribes you’re not marketing hard enough. I am not of that type. In e-commerce companies, quite often just once you’ve bought some thing we just you offer after offer after offer. And even if you like the company, if you weren’t planning on buying something else, it can get annoying and you can unsubscribe. So, I’m not a fan. We don’t do that, we have an e-commerce company, we do not do that and we don’t get many unsubscribes. But monitor them. If your unsubscribe percentages start to rise, you may have changed something that isn’t working. If they start to drop, you may have done something that is working, do more of that. What about how many new opt-ins? Are you tracking that? How many do you get each week? As a percentage of traffic or anything, is the rising, is it falling? What are you doing to increase it? So say you are getting 50 new opt-ins a week. Maybe you’re getting less, maybe you’re getting more, but over time if you can, don’t just stick with being happy with that. If you can get 50 you can get 51. If you can get 51, you can get 52; always try something new, change the color of the opt-in button, change the offer, change anything to try and increase it. But if you haven’t got the metrics if you’re not recording the metrics, how would you know? You need this information. Easiest place to record it and I’ve told you before, you should have a Gmail account, or a Google for work, which was previously known as Google Apps account because it comes with Google sheets and that’s just tracked online. So when you fill it in, it just saves, it’s there, it’s free, in a spreadsheet. And then anyone else, you can share with others, they can update it for you. Remember, you don’t have to be doing this, anyone can do it for you, anyone of your team, as long as you’ve shown them what to do. There are many more metrics, so think about in your business what is going to be relevant and help you advance your company. Now, it is a Thursday, so that means it is time for a drive time podcast, because we like to listen while we are in the kitchen, doing the washing up or in actual fact, obviously, I am doing a podcast rather than listening to one, I’ll be back doing the washing up in a sec. 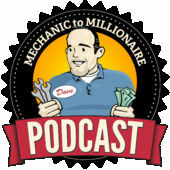 But today is from Dave McArthur, the Mechanic to Millionaire. His podcast, it’s absolutely fascinating. He does it with his wife and every episode I’ve listened to has his wife. I’m not sure she’s always in them. But, they’re great, they are real and they’re very relatable. They’re not sort of super-slick professional presenters, it’s genuine stuff and it’s a fascinating story of how he went from being a mechanic, to where he is now. And a lot of this is all in the head, you know it’s a mental game, so you need inspiration. So go check it out, check out his website and come back tomorrow for our Weekend Challenge. What metrics are you measuring?